She has treated malaria in Uganda, works in pre and post-op surgery and was once late for football training after delivering a baby. 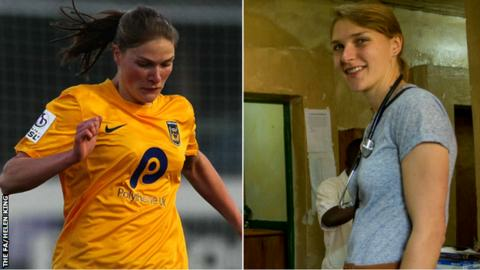 It is a busy life for Dr Helen King, the Oxford United midfielder. While her team-mates were in pre-season training, the 24-year-old was in East Africa where - in graphic detail - she recalls being among a small group of medical students on hand to deal with a patient affected by severe malaria. "One night a guy, about 18 years old, was basically unconscious and not really protecting his own airway, fitting, and he was repeatedly throwing up and inhaling his own vomit," said King, who is just weeks into her career as a doctor at the £430m Southmead Hospital in Bristol. "There were three of us medical students, a couple of nurses, and about 12 of the patient's family all standing around watching us. "Although we had done simulation training in med school, obviously in the UK as a med student you are right at the back of the room in any of those situations, so it was kind of my first experience of trying to take control in that situation and deal with the problem." After that kind of life or death experience, facing a Notts County side led by an all-star cast of England's bronze medal-winning World Cup players is not such an intimidating prospect. And while the shift patterns of a junior doctor have forced her to miss matches, King managed to put down her stethoscope long enough to put her boots on and score against Women's Super League One side Notts in their midweek Continental Cup group game. It is a juggling act the Oxford University graduate is used to, having travelled countless miles, clocked up long hours at work, along with writing essays, training for and playing matches. "I pride myself on being pretty efficient with my time-keeping, but there was one time I had to text Rich (Blackmore), our general manager, to tell him that I would be late because I'd been waiting all day to deliver a baby, which had come at the most inopportune time, so I obviously stayed for the delivery," King told BBC Sport. Increasingly, trying to be in two places at one time is an issue for the young medical professional. "It has been an eye-opening experience. I was thrown in a bit at the deep end as my first shift was a night shift, and you tend to be one of not too many doctors in the hospital and are dealing with whatever issues come up at that time. "At the moment I'm taking it training session by training session and game by game, really clinging on to my football career as long as possible." The former Bristol Academy midfielder is pleased to be playing the game at a time when is it still possible to build a career off the pitch without compromising on anything but sleep. "For the women's game, it is amazing that it is becoming increasingly professional," King said. "Obviously it is driving up standards and means that the majority of WSL 1 players can make a living out of football. "I've been fortunate to play at a time when there is a real professional attitude and the standard is higher than it has ever been, but if you are determined enough you can just about manage to combine that with starting a career in another area as well. "Personally, I would have hated to not pursue one or the other." Wales rugby union international and Harlequins centre Jamie Roberts is a trained doctor, having completed his studies at Cardiff University in 2013. England and Chelsea Ladies Eniola Aluko striker put her off-field career as a sports and entertainment lawyer on hold to focus on football. Torquay United goalkeeper Jordan Seabright quit football to become a car salesman in his home town of Poole. Last season, King was part of a diverse squad of part-timers, including a dental nurse, accountant and teacher, who featured for Oxford in their first season in WSL 2 - the second-tier of English football. The unheralded outfit finished second from bottom, but this season have already surpassed last term's points tally and are on track for a mid-table finish. Playing for Oxford in the newly-established semi-professional league is something she never imagined would happen. "Having the experience to play at a high level and with the level of professionalism that women's football has got to now was something completely new and nothing I thought I'd experience," she said. Life on the pitch and shifts looking after the sick are worlds apart, but be it in an Oxford United shirt or scrubs, King has found plenty of joy. "I don't score too many goals, so they are pretty special when they do come along," she smiled. "In medicine it is a massive privilege to be dealing with what, for a lot of patients, is one of the most significant events in their life, getting ill or having an operation. Obviously it is not usually a good event for them, but being there to help people through that is massive. "It is rarely as exciting or dramatic as Grey's Anatomy or Scrubs make it look, but just occasionally you get some pretty exciting moments and sometimes feel that you have actually intervened directly and positively. That is hard to beat."